Zur Präsentation sprechen: Christian Reder (Universität für angewandte Kunst Wien, Kunst- und Wissenstransfer), Georg Russegger (Coded Cultures), Matthias Tarasiewicz (parasew) und Michal Wlodkowski (5uper.net). Through the transformations of creative cultures, enabled by digital media and global communication networks, new practices and ability profifiles of artistic delineations and explorations are gaining grounds. 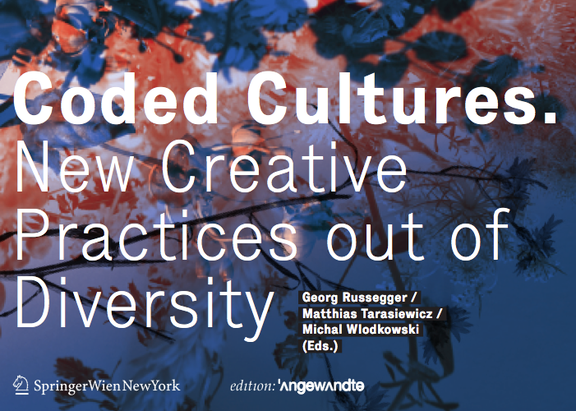 New global codes and cultures are emerging out of diverse, intercultural abstractions and inventions, connected through new ways of exchanging ideas and sharing knowledge. At the present day it is difficult to predict which catalysts and draft programs can be put into effect for the development of near future playgrounds in this domain. By offering several perspective shifts on developments in digital realm and mediated reality, exemplary theories and projects on the intersection of different codes and cultures have been collected for this book. Presenting essays, reviews and interviews from international artists, theorists, researchers and curators, gives the reader an overview on new vectors of creative and artistic projects departed from digital media related art and cultures. Itintroduces new and critical models of observations on the intersection of disciplines like art, science, technology and design.